Instructors at hundreds of colleges and universities have turned to How to Write Anything for clear, focused writing advice that gives students just what they need, when they need it. 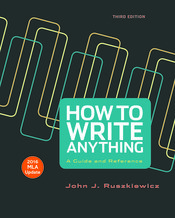 And students love it—because John Ruszkiewicz’s tone makes writing in any genre approachable, with a flexible, rhetorical framework for a range of common academic and real-world genres, and a reference with extra support for writing, research, design, style, and grammar. The new edition is accompanied and enhanced by LaunchPad for How to Write Anything, an online course space of pre-built units featuring the full e-text, multimodal readings, and adaptive LearningCurve activities to help students hone their understanding of reading and writing. The new edition also gives students more support for writing portfolios, more help working with the concept of genre, and more emphasis on critical reading and writing—all essential to academic success. And you’ll find more teaching ideas and syllabi from the community of teachers led by coauthor Jay Dolmage. The result is everything you need to teach composition in a flexible and highly visual guide, reference, and reader.